In the picture, there are four flags and the only one I can recognize is Kuwait's flag on the top left, but the other three I cannot identify. This is a photo of the full set of these, which are the flags of branches of Kuwaiti armed forces. 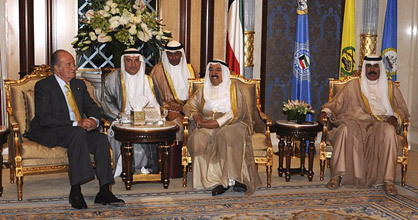 Under the constitution, the Emir of Kuwait is the supreme commander of the armed forces. Branches are: Army, Navy, Air Force, National Police Force, National Guard, Coast Guard. The first flag in this row is for Air Force (light blue), medium blue flag with white badge at right side is for Police (cleaarly visible its name on badge), last one at right is a darker blue flag for Navy. One of the yellow flags is of the National Guard; compare it with the badge here (upper right part). I assume the other yellow flag is for Army, but Army has a similar badge that can be seen on three-striped, yellow-blue, dark blue flag at left side. This is a similar flag as of Chief of Staff of Kuwait (photo). The Kuwaiti Army bagde is seen here. I haven't heard anything about a Coast Guard flag or logo.